The second and concluding part of a survey of the fraileas of southern Brazil. Photography by the author. Since Frailea was first described by Britton & Rose in 1922, recognizing eight species (two of which were regarded as being of uncertain relationship), the number of names at specific and infraspecific rank in the genus has increased substantially, mainly from the 1970s onwards. 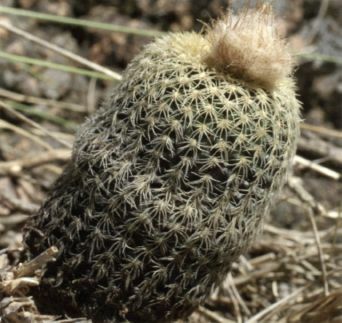 Today there are about 300 names in the cactus literature, most of them invalid or only provisional (Metzing & Kiesling, 2006). Clearly the number of existing names is much higher than the number of species in nature! There is no modern revision of the genus; thus we do not have as yet an authoritative reference work on Frailea. The most recent checklist compiled by Hunt (2006: 122-125) accepted twelve species and a further six heterotypic subspecies. 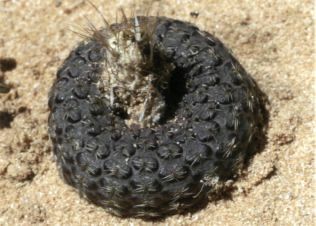 Of those plants listed by Hunt that occur in the state of Rio Grande do Sul in Brazil, the only species that I failed to find was Frailea curvispina Buining & Brederoo. It is with Hunt's checklist as a basis that I now present the following account of the species that I have seen in the field. Frailea buenekeri W R Abraham. This species occurs as two subspecies. The typical subspecies (ssp. buenekeri) grows near the town of Vila Nova do Sul, while the subspecies densispina Hofacker & Herm grows more to the south, to the west of the town of Lavras do Sul and east of the small village of Ibaré. Unfortunately I did not find plants of the typical subspecies, but I saw subspecies densispina in a number of places in the area where it occurs, growing in granitic rock outcrops, in pockets of soil between the rocks, together with mosses, lichens, grasses and other vegetation (Figs. 26 & 27). It is a beautiful little plant of no more than about 3cm in diameter, with a dark green to winered epidermis, many ribs divided into low tubercles, and areoles with a dozen or so creamy yellow to white radial spines appressed against the body of the plant and pointing downwards. Below each areole there is a faint, dark, crescent-shaped mark. The plants are globular, becoming columnar in age. 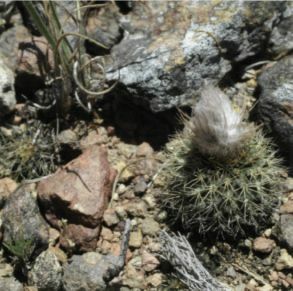 Another characteristic of this taxon is the tuberculate spines, which have small projections along them, thus creating the illusion of being slightly feathered. Near to the places where I found F. buenekeri ssp. densispina, I also found forms of F. pygmaea. Perhaps to compensate for the fact that I did not find the typical subspecies, I did find a yet more spectacular subspecies of F. buenekeri, that I have provisionally named subspecies cen­trispino. (Figs. 28-29 & rear cover). 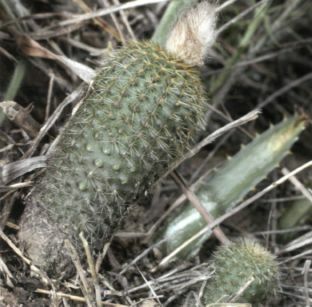 This plant was found more to the east than any of the other subspecies, near the town of Santana da Boa Vista. 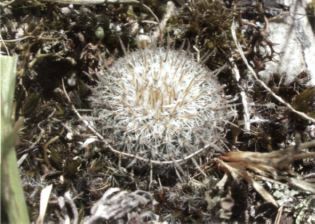 It has a more dense cover of pure white spines, and is distinguished by the presence of a single central spine, which is stronger than the radial spines and varies from white to yellowishbrown in colour. Also, the tubercles on the spines are more developed, causing a greater impression that the spines are feathered. 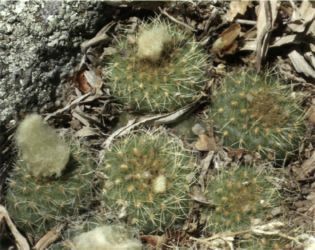 The overall appearance of the plants makes them superficially resemble the forms of Mammillaria duwei that have central spines. 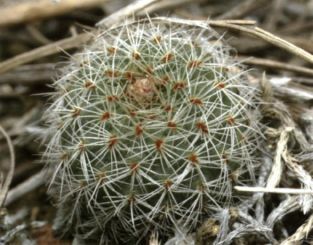 When I found the first plant of subspecies centrispina, my first impression was that it was a very young seedling of Parodia scopa. The plant was somehow strange for a P. scopa, but it was not until I found other specimens and examined them at close range - on my hands and knees - that I realized that it was a Frailea and not a Parodia at all! At the same place where I found F. buenekeri ssp. centrispina I also found a form of F. pygmaea. Frailea castanea Backeberg is perhaps the most attractive species of the genus. 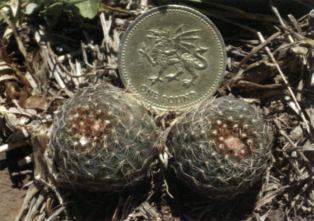 The plants resemble a miniature Euphorbia obesa or Astrophytum asterias, with its body flat with the ground, and having many low ribs with strings of areoles bearing very short black spines (Fig. 30). The number of ribs varies between different populations, as also does the shape of the flowers, even in the same population (Fig. 31). The colour of the epidermis is usually dark reddish-brown, matching remarkably well the colour of the soil where the plants grow. 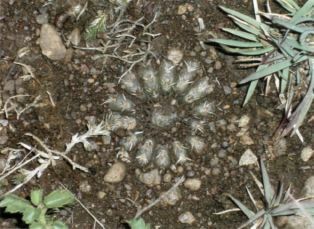 This, and the fact that the plants retract into the soil during dry periods, makes them quite difficult to spot (Fig. 32). The species grows in areas of shallow reddish soil with rock outcrops of iron-rich sandstone. 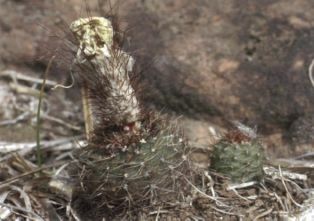 I found several popula­tions in the area between the towns of Quaraí and Alegrete, and the plant was quite common in places, with hundreds of indi­viduals to be seen. Growing together with F. castanea I often found F. pumila, and in a few places also F. phaeodisca. Frailea cataphracta (Dams) Britton & Rose. This species was originally described from Paraguay, but it was recently discovered growing in Rio Grande do Sul as well (Gerloff, 1997). Actually, I found it because I remembered the description given by Gerloff of the place where the plant grew. I was travelling with Graham Charles and Chris Pugh, coming from the town of Manoel Viana in the direction of the town of Sao Francisco de Assis, when a few kilometres before arriving in Sao Francisco de Assis we saw a table mountain on the horizon. 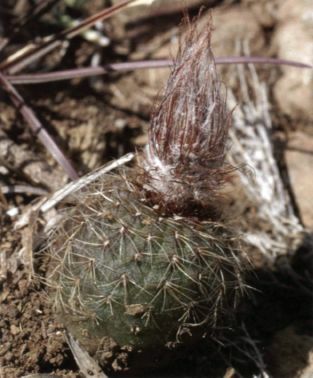 I told the others that Gerloff found Gymnocalycium buenekeri and Frailea cataphracta in a place similar to that one, and that we should check that mountain. We took a side road and drove closer. The mountain was located inside a farm, so I asked the farmer's permission to see the mountain, and for information on how to get there. It turned out that there was a track leading to the base of the mountain, and that from time to time the place was visited by Germans, which encouraged us even more. 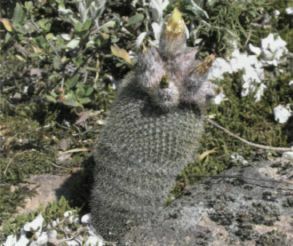 We arrived at the base of the mountain, and while Graham and Chris were searching for G. buenekeri on the mountain sides, I was trying to recall more of the article and the account of where the Frailea was growing. I then remembered that it was growing near a tree, so I walked towards the only big tree to be seen. Sure enough, there were the plants of F. cataphracta growing in the sand amongst the tufts of grass! 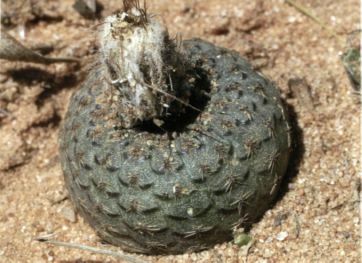 Frailea cataphracta has a globular body, intensely dark green to purplish and almost black in some plants (Figs. 33-35), with up to 20, low, tuberculate ribs. 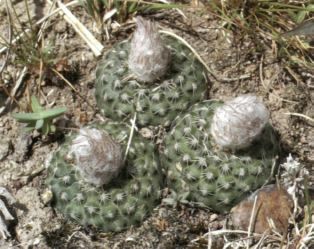 The apex of the plants is concave, and the areoles have black felt and a few short brownish to white spines. Below each areole there is a dark crescent-shaped mark, giving the plants a very characteristic appearance. 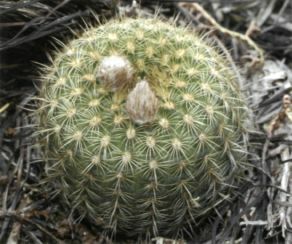 This dark mark below the areoles is a feature present in many Frailea species, but it is most conspicuous in F. cataphracta. I found dozens of plants growing at this locality, and some were even in flower. It probably rained not long before our visit, because all the plants were very plump and prominently above the soil. In periods of drought, the plants probably retract into the soil and are covered by the soft, reddish sand in which they grow. This sandy soil is derived from sandstone rocks, and is very common in this area around the table mountains. Perhaps there are more populations of F. cataphracta in this region, but so far this seems to be the only one known. Frailea fulviseta Buining & Brederoo. This species (Figs. 36-38) grows in the same table mountains as F. cataphracta, but instead of growing in the sandy soil, it is to be found in sandstone rock crevices or in the middle of the clumps of Dyckia (Bromeliaceae), on the sides or the top of the table mountains. I found this species in a number of places near the towns of Alegrete, Manoel Viana and Sao Francisco de Assis, always in the same kind of habitat. 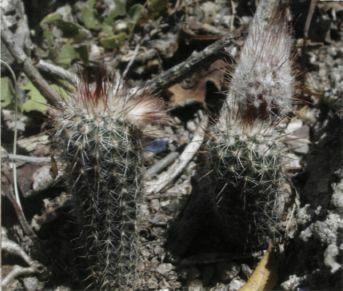 In spite of the name (fulviseta means yellowish-brown bristled), the spines of this species can vary in colour from white through yellow to brownish-red. Below each areole there is a faint dark crescent-shaped mark. It is a columnar species, and can become quite elongated, up to 12cm or more in length (Fig. 36). 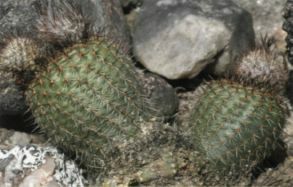 F. fulviseta resembles F. buenekeri in overall morphology, but the spines of F. fulviseta are stiff, smooth and glassy. I found a few plants whose apexes had divided dichotomously to form two or three heads (Fig. 38). Frailea gracillima (Lemaire) Britton & Rose. Here is a species that is very widespread and morphologically quite variable (Figs. 39 & 40). It is very common in the mountainous region of the southeast of Rio Grande do Sul, coming from the vicinity of the capital city, Porto Alegre (from where the synonymous Frailea alacriportana Backeberg & Voll was described), all the way to the south and as far west as Santana do Livramento. It grows in gravelly soils, under shrubs and amidst grasses, or in humusrich, moss-filled pockets of soil in the rock outcrops. 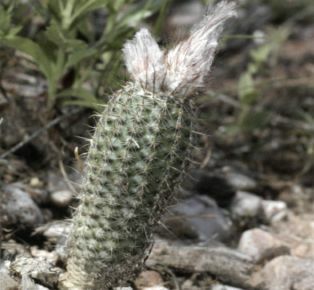 Frailea gracillima is the typical columnar species of the genus, its body always more elongated than wide. The ribs are tuberculate, and the central and radial spines have different colours. The central spines are dark reddish-brown to black, while the colour of the radials varies from white to yellow. Some forms of F. gracillima are rather small, with pencil-thin stems no longer than a couple of centimetres in height, with few ribs and long central spines (for instance, the form described as Frailea lepida Buining & Brederoo), while other forms are much more robust, with stems several centimetres long (up to 15cm) and up to 5cm in diameter, with numerous ribs and short spines. The archetypal form of F. gracillima is the one shown in Fig. 39, with few tuberculate ribs, one or two central spines which are dark in colour and much longer than the whitish radial spines, and a faint dark crescent-shaped mark below each areole. There are countless variations to this pattern, and each population seems to be slightly different. 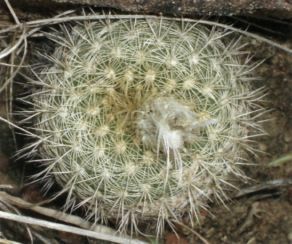 There are plants that have straight central spines, while others may have curved spines, and the mark below the areole can be absent. The only variation of F. gracillima that is currently accepted at infraspecific rank is subspecies horstii (Ritter) Braun & Esteves Pereira. This is a stouter variation with more ribs and central spines, which are of more or less the same length as the radial spines (Figs. 41 & 42). It grows in the area between the cities of Caçapava do Sul, Encruzilhada do Sul and Piratini. The typical form is shown in Fig. 41, but there are even stouter forms like the one shown in Fig. 42, that was found south of Encruzilhada do Sul. In spite of the difference between subspecies horstii and subspecies gracillima, there is no clear-cut separation among the two forms; rather, they gradually change and intergrade along the distributional range of the species. In spite of being quite variable, F. gracillima is unmistakable and easy to recognize. 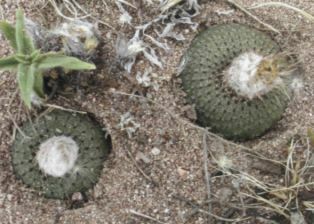 Frailea mammifera Buining & Brederoo is divided into two subspecies, the typical subspecies (ssp. mammifera) growing in Rio Grande do Sul north of the town of Dom Pedrito, and subspecies angelesiae R Riesling & Metzing growing in Dep. Concordia, Prov. Entre Rios, in the northeastern part of Argentina. The place that I visited was the type locality of this charming species, which is globular, up to 3cm in diameter, and has around 16 tuberculate ribs, the tubercles being very prominent and conspicuous, hence the name (Figs. 43 & 44). The colour of the plants is green, and below each areole there is a dark crescentshaped mark. The areoles have about eight spines, all radial, orangeyellow in colour and tuberculate, conferring them with a slightly feathered appearance. The plants grow in granitic rock outcrops, in the pockets of soil between the rocks. I did not find many plants of this species at the locality that I visited, but I do not know if the reason is because it is simply a rare plant, or if the plants just happened to be "invisible" and hidden in the soil at the time when I visited them. In overall morphology, F. mammifera is quite similar to F. buenekeri, and it does not grow very far from where F. buenekeri ssp. densispina also occurs. These two species share the feature of having tuberculate spines, so perhaps they are closely related. Frailea phaeodisca (Spegazzini) Spegazzini. In my opinion this is one of the most attractive species of Frailea, along with F. castanea and F. buenekeri. 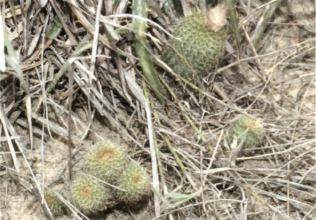 The plants have a dark green to brownish, flattened body, many low ribs which are only discernible because they are separated by dark vertical lines, areoles with black felt, many small, glassy, white radial spines appressed against the body of the plant, and a faint, darker, crescent-shaped mark beneath the areoles (Figs. 45-49). 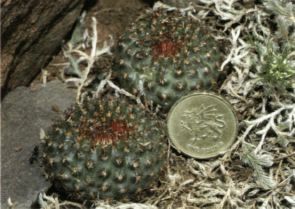 Frailea phaeodisca was originally described from Uruguay as a variety of F. pygmaea, but later raised to the status of a species. It has a wide area of distribution, but nowhere is it a common species: I found only a handful of populations, a couple close to Minas do Camaqua near the city of Caçapava do Sul (Figs. 45 & 46), and the others located more to the west in the region between the cities of Santana do Livramento and Quaraí. 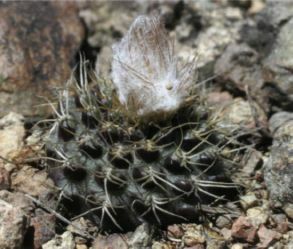 Plants from the latter area were described as a distinct species, Frailea perbella Prestlé, but it is no more than just a variation of F. phaeodisca with a more elongated body, darker areoles and whiter spines covering the whole body (Fig. 48). In the same region one can also find plants with characteristics intermediate with the more common form of F. phaeodisca (Fig. 49). The plants grow in pockets of sandy soil on the tops of the sandstone rocky outcrops (Fig. 47) or in rock crevices, and in the same way as F. castanea they can disappear completely during periods of drought, the bodies being pulled down to soil level by the strong, contractile tuberous root. Frailea pumila (Lemaire) Britton & Rose. This species has a very wide distribution, and besides Rio Grande do Sul in Brazil it also occurs in Argentina, Paraguay and Uruguay. There is even one form that was reported from Colombia and described as an independent species, Frailea colombiana (Werdermann) Backeberg, but its occurrence in an area so remote from the remainder of the distribution of the genus is probably the result of introduction by man. As can be expected of a species that occurs so widely, there are several names given to local variants. 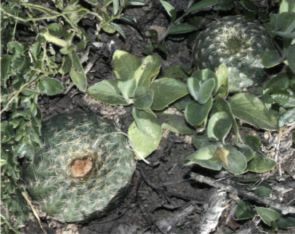 However, at least in Brazil, the plants of F. pumila are fairly uniform in appearance, with the most noticeable variation being in the colour of the spines, that can vary from whitish (Fig. 50) to creamy-yellow (Fig. 51) to golden-yellow (Fig. 52) and even to reddish-brown (Fig. 53). The golden-yellow forms especially contrast very well with the dark rocky places where they grow, making them very easy to spot. 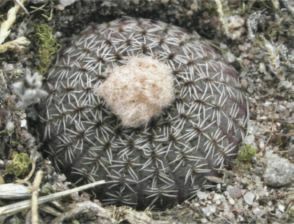 Frailea pumila is one of the largest of the globular species, attaining a diameter of up to five centimetres. 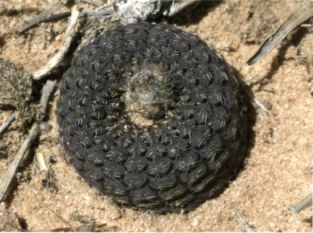 It has many low, tuberculate ribs, while the areoles have whitish felt and about 18 radial spines that are more or less curved and point in all directions, and between one and four central spines, which are not very different from the radials. Old plants become slightly columnar. This species is quite common in the southwestern portion of the state of Rio Grande do Sul, growing from Santana do Livramento westwards to the border with Argentina, and all the way north up to the cities of Santiago and São Borja. I often found it growing in the rocky beds of creeks (called arroyos in this part of Brazil) or in areas of flat rock outcrops subjected to seasonal flooding. The plants were most plentiful in the places which were obviously flooded during the episodes of intense rain. In these places F. pumila grows in the crevices of the rocks together with mosses and lichens, the plants firmly attached to the rocks by their strong tuberous roots. Frailea pumila shares its habitat with a few other Frailea species, namely F. castanea, F. phaeodisca and F schilinzkyana (F. perumbilicata). Frailea pygmaea (Spegazzini) Britton & Rose. As the name implies (pygmaeus meaning dwarf), this is perhaps the smallest of all Frailea species, some forms having heads no wider than one or two centimetres. It is also quite widespread, growing in Brazil, Uruguay and Argentina. In Rio Grande do Sul I found it growing in the mountainous region in the southeast of the state, but also westwards up to the region around the city of Santana do Livramento. I found numerous populations of F. pygmaea, and it was often quite common. However, this is another very variable species, even more so than F. gracillima, and while F. pygmaea is quite uniform in the centre of its area of distribu­tion in Rio Grande do Sul (in the more southeastern regions of the state, from the city of Bagé eastwards and southwards), in the northern and western edges of its range there are quite distinct forms. In accordance with the variability of the species, many names have been created for different forms of F. pygmaea, some of them correctly published but the majority invalidly. 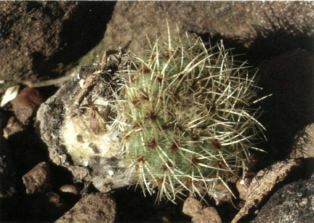 Typical F. pygmaea has a flattened, light green body, low ribs which are tuberculate (more noticeable when the body is dehydrated), the tubercles being flattish and with areoles bearing whitish or yellowish wool and a few short, bristly, glassy, white radial spines, and rarely also one or two small central spines (Fig. 54). 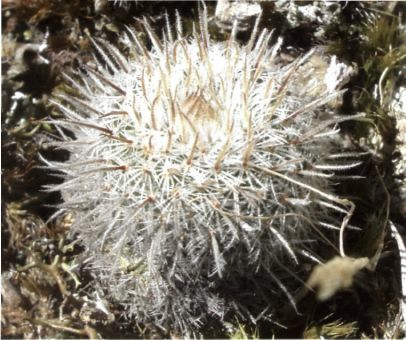 Near the city of Caçapava do Sul I found plants with a more globular body and areoles having longer white spines, the base of the spines being orangeyellow in colour (Fig. 55). Southwest of Caçapava do Sul, west of the town of Lavras do Sul there are plants which have distinctive dark crescentshaped marks below the areoles (Fig. 56). 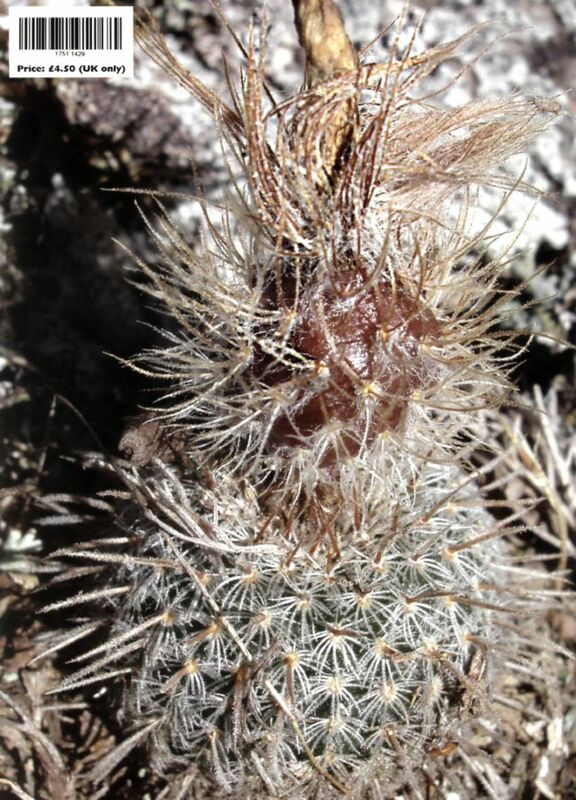 A bit more to the west, north of the city of Dom Pedrito, I found plants with yellow spines and wool (Fig. 57). While different from each other, all these variants are not really that far from the typical form. The most distinctive variation, and the only one accepted at infraspecific rank that grows in Rio Grande do Sul, is subspecies albicolumnaris (Ritter) Hofacker. This form is more robust, with a glaucous, greyishgreen epidermis and many ribs not broken into tubercles, the ribs being straight and vertical. As the name implies, with time this form becomes more or less columnar in shape (Fig. 58). Near the city of Santana da Boa Vista I found another tall form of F. pygmaea (Fig. 59), which is not the same as subspecies albicolumnaris. The plants in this place are very stout, up to 4cm in diameter and 8cm in height, being distinctively columnar, but other than the size and shape, they are very similar to typical F. pygmaea in spination and the presence of a faint, dark crescent-shaped mark below each areole. So far the most puzzling form of F. pygmaea that I found was a population growing just north of the city of Quaraí in the south-western region of the state (Fig. 60). The overall appearance of the plants and the locality where I discovered it agree with Ritter's protologue of Frailea aureispina, a taxon that is put into the synonymy of F. pygmaea. I compared the plants that I discovered with the description and illustrations provided by Ritter (1979: 209) and have no doubt that what I found is the same as F. aureispina. However, this taxon is the one that least resembles F. pygmaea:. 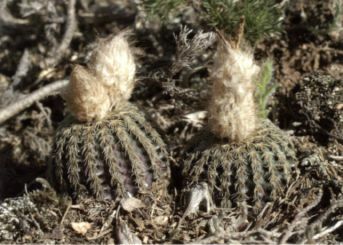 the dark felted areoles are similar to the areoles of F. phaeodisca, and the yellow to orange spines are stronger than those normally found in F. pygmaea. In this area no other forms of F. pygmaea grow, but F. schilinzkyana (F. perumbilicata) is quite common. 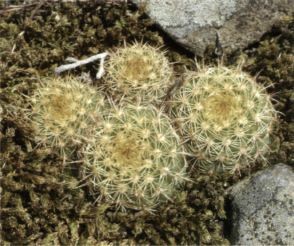 This latter species also has strong spines, which vary from yellow to dark brownish in colour, but other than in these characteristics it does not resemble the plants that I believe to be F. aureispina. It is possible that the plants that I found and that Ritter named F. aureispina are not related to F. pygmaea at all, its characteristics being the result of natural hybridization between F. phaeodisca and F. schilinzkyana (F. perumbilicata), both of which grow nearby. This is just a hypothesis, but clearly this is a plant that needs to be studied in more detail. 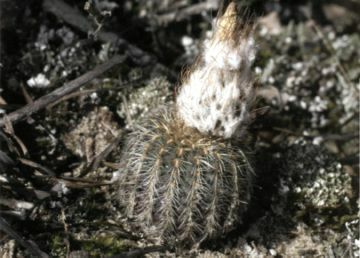 Frailea pygmaea usually grows in the crevices of rocky outcrops, between the pebbles near these outcrops or in grassy, gravelly areas where the thin soil depth minimizes any competition from other plants. Other species that I found growing in the same places as F. pygmaea include F. gracillima and F. buenekeri, but in the case of the plants that I identified as F. aureispina, they were growing together with F. castanea. Frailea schilinzkyana (Schumann) Britton & Rose. 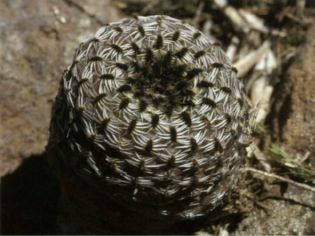 The form of this species that grows in Rio Grande do Sul was given the name Frailea perumbilicata by Ritter (1979: 206-207). Hunt (2006: 125) mentioned under F. pumila that its "differentiation from F. schilinzkyana is not altogether clear". However, F. schilinzkyana (F. perumbilicata) grows sympatrically with F. pumila in several places in the region between the cities of Santana do Livramento and Quaraí in the state of Rio Grande do Sul, where both species are clearly distinct. 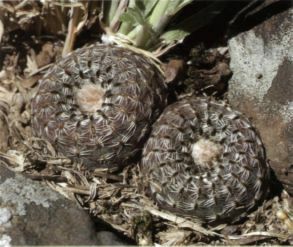 Alternatively, F. perumbilicata could be a species distinct from F. schilinzkyana, because while the distinction between F. schilinzkyana and F. pumila is not clear, F. perumbilicata is positively distinct from F. pumila. This view is also supported by the different descriptions of F. schilinzkyana and F. perumbilicata given in Hunt (2006: 124-125). Until the question of the identity of F. perumbilicata is resolved, I will refer to it as F. schilinzkyana followed by the name F. perumbilicata in parentheses. 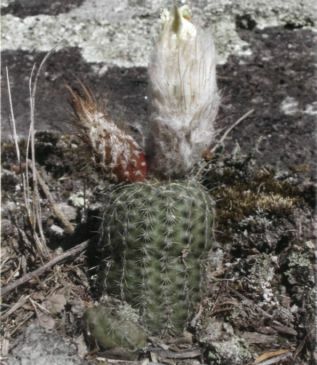 Frailea schilinzkyana (F. perumbilicata) is found in the region around the city of Santana do Livramento in southwestern Rio Grande do Sul, and also westwards to the city of Quaraí. 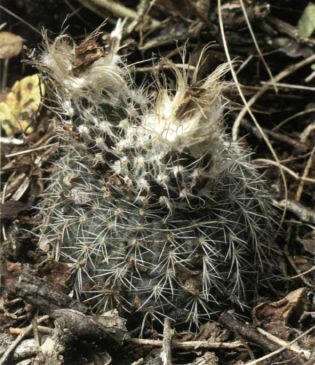 Plants of this species somewhat resemble F. pygmaea, differing by a more globular body which is dark greyishgreen to brownish, a concave apex (reminiscent of F. cataphracta), flat ribs which are scarcely tuberculate, areoles with strong spines which are dark yellowish to reddishbrown and even black in colour and the more conspicuous dark bristles in the areoles of the flower tube (Figs. 61-64). It grows in the crevices of sandstone rocky outcrops, and it is locally fairly common. F. castanea, F. phaeodisca and F. pumila also grow together with F. schilinzkyana (F. perumbilicata). 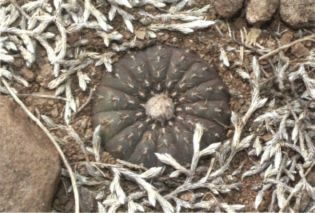 The taxonomy of Frailea is far from being thoroughly resolved, and detailed studies should be conducted involving more populations and greater population sampling in order to assess the intra- and interpopulational patterns of morphological and genetic variation of the plants in the field. A modern revision of the genus should only be attempted after such a thorough survey. Taxonomic questions aside, Frailea is a genus that contains many beautiful and interesting little plants, as hopefully the pictures and descriptions in this article have shown. The plants of this genus do not take up much space, and deserve to be grown more widely. Port. Metzing, D & Kiesling, R (2006) Notes on the diversity, biology, and taxonomy of Frailea (Cactaceae). Bradleya 24: 115-128. Ritter, F (1979) Kakteen in Sudamerika. Band 1. Privately published, Spangenberg. 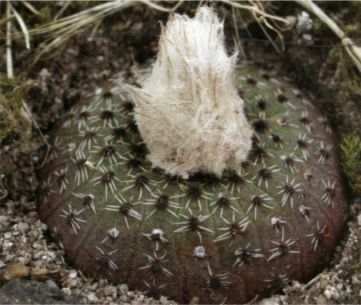 A sensational novelty related to Frailea buenekeri subsp. densispina discovered by Marlon Machado in Rio Grande do Sul, Brazil. 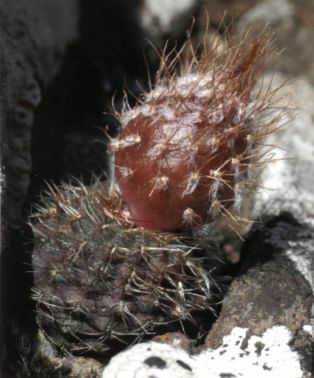 All spines are strongly pubescent, even those of the fruit, a character shared by ssp. densispina to a lesser degree, which also lacks the long central spines. The population suffers from the grazing of sheep, and many of the plants had had their heads eaten, but for­tunately most are able to regenerate new heads. 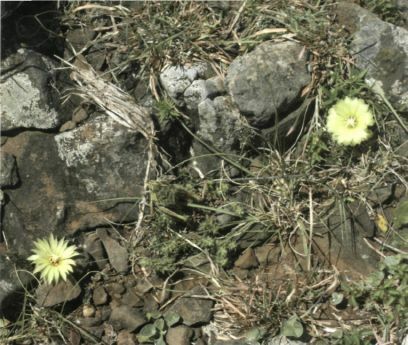 The discovery of this new plant is described in this issue in the second, concluding part of a review of southern Brazilian fraileas by Marlon Machado, who is also the photographer.